Brown ground beef in skillet. Chop tomatoes, onion, and olives and place in a large mixing bowl. 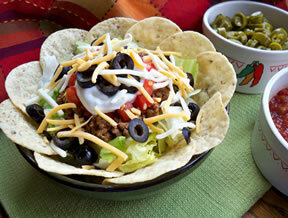 Add red beans, shredded cheese, and ground beef to tomatoes, onions, and olives; add package of dry taco seasoning. 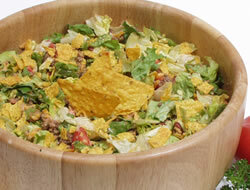 Add lettuce and Doritos last so they won't become soggy, then add can of tomato sauce. If mixture is a little thick, you may want to add an additional can of tomato sauce. Mix well and serve.